In the third volume of the Fourth Talisman series, the hunt is on for the three daevas whose powers saved the world once before…. On the wave-tossed White Sea, realm of smashers and sea monsters, a ship is carrying Nazafareen and Darius to the Isles of the Marakai, where the wise woman Sakhet-ra-katme has guarded the secret of the talismans for centuries. But another is searching too, a man born in the brutal prison of the Kiln, who plans to use the talismans to free the Vatras and their mad king. Between them stands a young Marakai girl, ignorant of her own powers. From the moonlit treasure vaults of the Isles to the emperor’s lavish palace in Tjanjin, Nazafareen and Darius face their deadliest and most cunning foe yet. In the mountain fastness of Val Moraine, the Pythia’s minions are on the scent of another talisman, this one from the Danai clan. Trapped behind a thick wall of ice, everyone’s going slightly mad—the perfect cauldron of suspicion and betrayal for Thena, who sees a chance to redeem her failure and bring the talisman back to Delphi. Then she’ll be free to indulge her twisted obsession with Darius—and make him pay. And in Samarqand, Javid is drawn into the treacherous currents of a royal succession. When the old king dies and his son takes the throne, the depths of the prince’s depravity become clear. A journey north reveals the source of the spell dust he’s addicted to—and leaves Javid with an impossible choice. 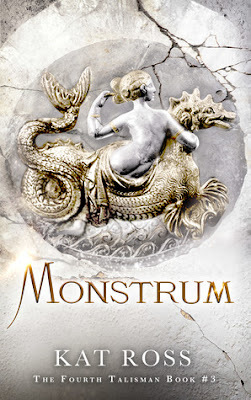 Monstrum is the third instalment in Kat Ross’s riveting Fourth Talismans series and is another intricately woven and told story of adventure, magic and high stakes danger. On a ship in the middle of the ocean, Nazafareen and Darius travel alongside the followers of Dionysius on a hunt for the three daeva’s whose abilities can save the world. Hoping a wise woman may be able to point them in the right direction, Nazafareen and Darius know they are not the only ones searching. Across the ocean, a man from a long exiled Vatras clan seeks the fourth talisman as well and he will stop at nothing to find it, even if it means bending a young girl unaware of her own powers to his will. Various forces are at work and as different individuals face cunning foes, the only way to stop untold horrors are for daeva clans to work together; if only they don’t kill each other first…..
Kat Ross is back with the third novel in her Fourth Talisman series and takes her readers on another complex, dangerous and exciting story. Personally I love having the opportunity to follow Nazafareen and Darius again—I’ve adored them since the first series—but can also see that each instalment in the Fourth Talisman series is becoming more complex and intricate as more and more characters are being introduced that we follow and join throughout the series. It’s occasionally necessary to pay close attention so not to miss anything, but I have to commend Ross for such a detailed storyline. Nazafareen continues to remain my favourite character although Culach and Darius hold special places in my heart. I love her overall characterisation and feel like she’s easy to follow, capable and determined. Darius too is very capable and I adore the relationship they have together. Kat Ross certainly knew how to develop their connection and continue to maintain it as the novels progress without it being overbearing within the story. Overall, Monstrum was another dashing read and I can’t wait to see what Kat Ross does next. There were both revelations and new questions raised in this novel and I have no doubt the next one will be as thrilling and sure to both answer them as well as raise others. Bring it on—I can’t wait to see what Nazafareen, Darius and their friends encounter next! Final Thoughts: Another great read that leaves me ready for the next one pronto! Thanks for hosting today, Rachel! This sounds like a great series!